The Charts are in, and it’s a shocker. 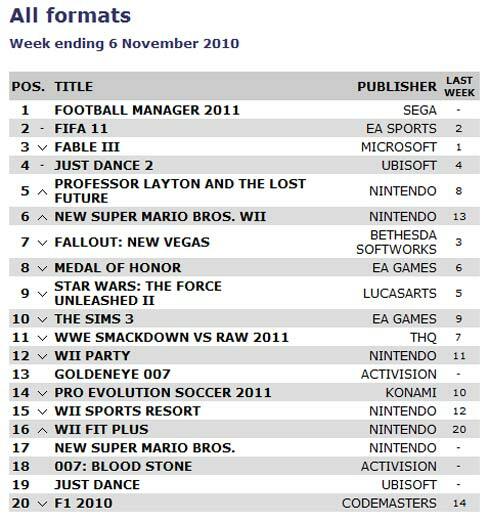 No not because Football Manager 11 has taken the top spot, because that’s expected in the UK. But because Activision’s Goldeneye 007 didn’t even manage the top ten. The Goldeneye reboot entered at number 13, meanwhile Football Manager sold more than Pro Evolution Soccer on all platforms, despite Football Manager only being on PC. Don’t worry Activision, at least you have Black Ops releasing tonight, next week will be yours for sure. See the full top twenty below.